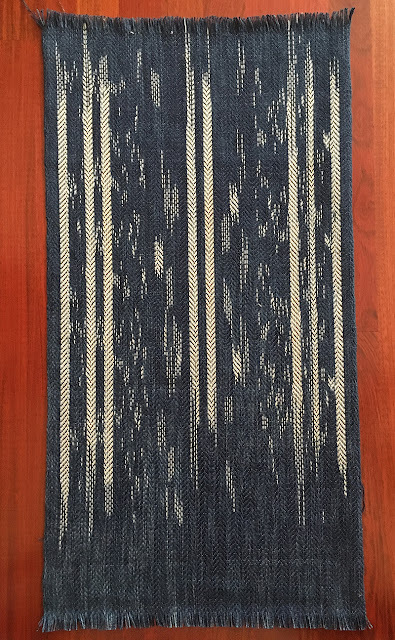 Last year I was scanning the shelves of the Providence Public Library looking for books on dyeing and shibori, when a title caught my eye: Woven Shibori. (An aside: PPL has an incredible collection of textile books.) I immediately checked out this book by Catharine Ellis, and eventually bought myself a copy of the second edition, which focuses on natural dyes. Inspired by the book, I immediately put on a warp and have been experimenting with this technique these last few months. Woven shibori is done by weaving with supplementary weft (I use cotton, color-safe embroidery floss) to make the pattern on the loom. Once off the loom, I pull these weft tight and dye. With each experiment I’ve learned something new. Soak the fabric for a few hours before dyeing. In fact, overnight was even better. Once the threads are tied, the fabric is very tight. Soaking it overnight made sure it was very wet, and took the indigo much better. Why is it that I seem to need to learn this very simple fact over and over again? I recently brought a box of notebooks home that had been stored in my parents basement and was in awe at what good notes I used to take. Woven shibori involves many steps, and each step is another decision. It’s so frustrating to see a finished piece and not know what I did to get it. It’s tempting to try and add in many different design elements. An interesting ground weave, an interesting pattern using the supplementary weft, and then there is still dyeing it. I find it’s been better to take my time and add in elements slowly. There are already a bazillion design choices all while only using a plain weave ground! It’s funny how it's often harder to keep things simple. Woven shibori really is an exercise in patience. While weaving, I really have no idea how it will look once it’s off the loom and dyed. Will this pattern look good? Will the ground weave work with the pattern created by the dyeing? Maybe this is why it’s even more exciting when I undo the threads after dyeing, there are so many steps before I see what the finish fabric will look like. 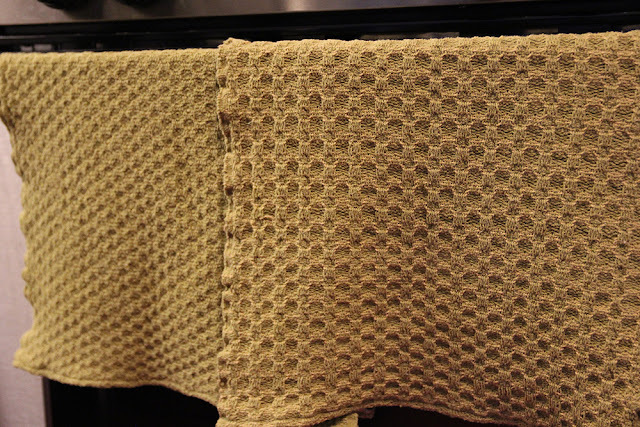 Here are a couple examples of the woven fabric off the loom, and the finished dyed fabric. These are all made using an 8/2 Tencel yarn in the warp and weft that I bought from Gist Yarn. This yarn has a gorgeous hand when woven, and dyes beautifully. My warp is set up with a sett of 24 ends per inch. For the supplementary weft, I’m using an inexpensive embroidery floss. This floss is color fast and won’t bleed when dyed. It’s also very smooth, with helps for gathering, and also ties easily and tightly. I cut off the excess after I tie it to try and get the most out of the floss as I can, as there is a lot of waste otherwise. On my loom at the moment is a warp from which I’m attempting two scarves. Since I actually took good notes on my last sample warp, I’m seeing if I can recreate a pattern based on these notes. Hopefully I’ll have something new to wear this fall! Video of Catharine Ellis explaining this technique. Our first full day in Guatemala, I experienced something very out of the ordinary. No, it wasn't walking down the street of a colonial city while a volcano was puffing out smoke in the distance. It wasn't peering into ruins of a church ruined by an earthquake and subsequently abandoned. 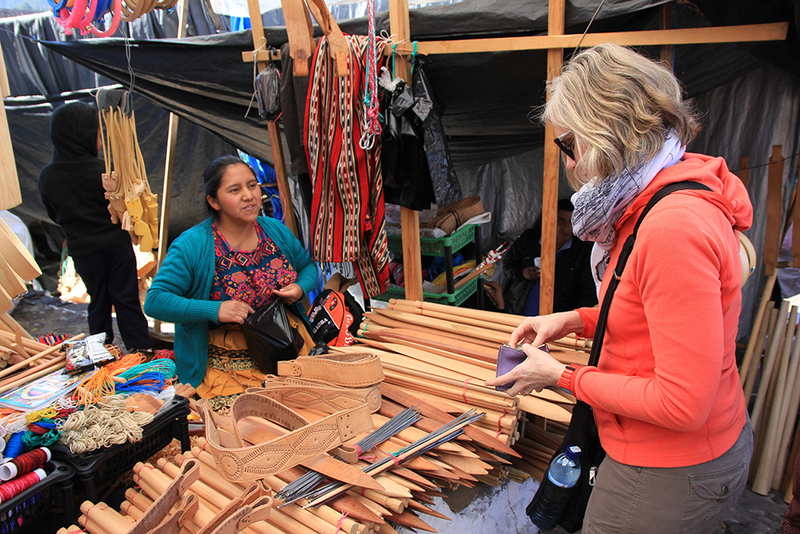 It was answering our guide's question, "Why did you decide to come to Guatemala?" and answering "I'm a weaver." The strange part? He was not at all confused. He just answered, "Oh, nice, you'll enjoy all our textiles." My backstrap weaving workshop in San Antonio Aguas Calientes, photo by my weaving teacher Lady. Saying "I'm a weaver" is something I don't actually do that often here at home, because most people are very confused. While many are often interested, it's a novelty. It is never taken as something normal and valued, not like in Guatemala. 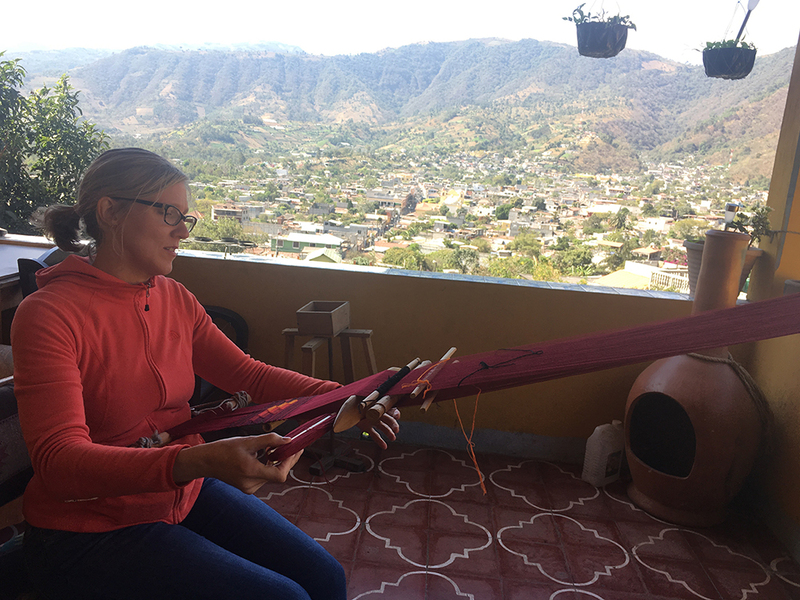 Throughout our 10 days there, I told a lot of people I was a weaver. And told a lot of weavers, "Soy una tejedora." My job and career have pivoted over the years, and led me in directions I enjoy, but would never have anticipated. 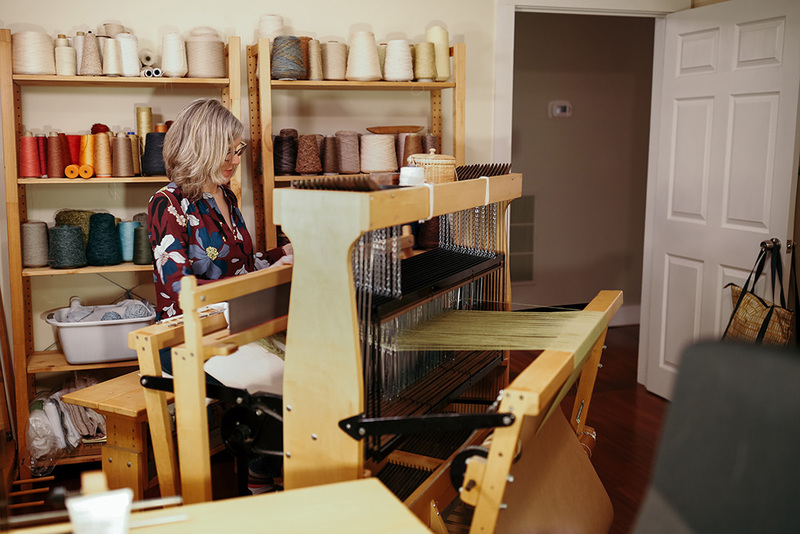 While I've been working on creative projects all along, I always felt like weaving was tied with industry and tied with a job and an income. It's taken me a while to release that. The loom saleswoman at the Chichicastenango market. These past two years I've been weaving a lot, dyeing with indigo, and engaging more with makers and artists. It's been liberating to explore, improve my skills and separate the making from a job. It's been satisfying to know that I don't regret my education just because I'm not working in the industry I trained for. In fact, I'm doing the best work I've ever done at my loom. I'm a weaver, soy una tejedora. When I started exploring indigo dyeing last year, I couldn't wait to attempt ikat, despite knowing that it is an incredibly laborious technique. 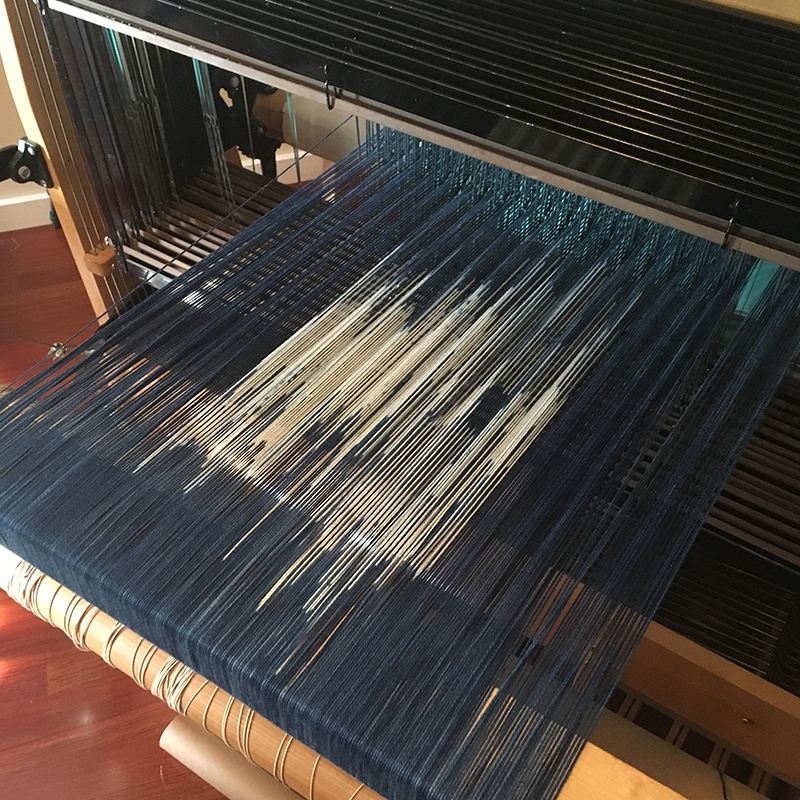 For those unfamiliar with the technique, the first step is to wind a warp. 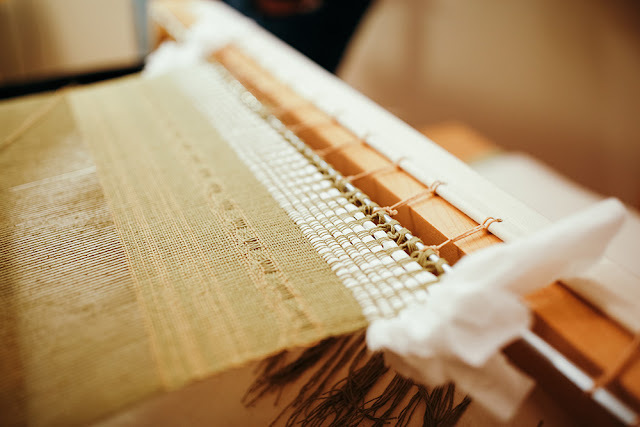 The warp threads are then bound in a design so that when dyed, the dye will resist those bound areas and the design will be visible. The warp is then dyed, rinsed, and the tied areas are unbound. At this point, the warp is ready to be put on your loom, and weaving can finally begin. Ikat is a technique used in cultures around the world, with each culture making it uniquely their own. For my explorations, I was looking an examples of simple designs, made with just one dye bath. During my first attempt, I had used regular household plastic wrap to bind the yarns, which proved a terrible idea. The plastic wrap clings to itself, which is handy in the kitchen, but not so much when binding warp threads. For my second attempt, I used plastic tape that artist and friend Paula Becker passed along to me. It made all the difference as I was able to bind tightly, and work with it more easily. After wrapping with the tape, I reinforced the area with a strong thread to be sure that it was tight and no dye would penetrate. In my second piece, I used dyed yarn as a ground weft, with an inlay technique in areas to make the white areas more white. Lastly, I had threaded my loom with a pointed draw so I could play with twill structures. 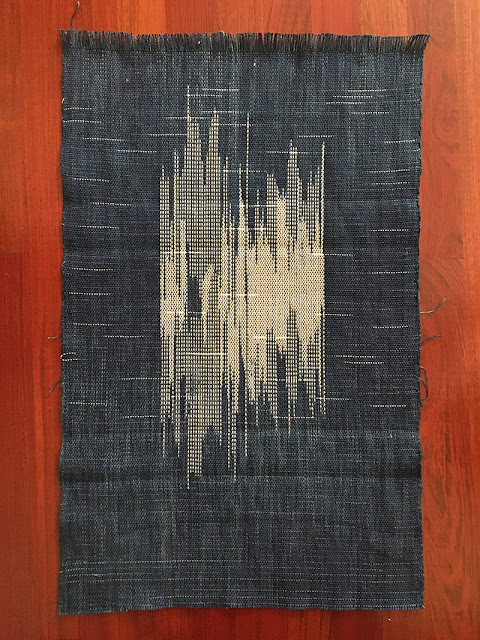 While I do appreciate seeing the structure more on this piece, I found I prefer pieces woven with plain weave as the pattern already has so much interest. When binding my ikat, I imagined the shapes would hold together more. Yes, ikat is known for its shifting edges, but my pieces seemed to be shifting more than I expected. I'm not sure if I'm doing something wrong, it takes more practice, or if I should ask a friend to help me crank the warp on next time. Regardless, as I wove my warp, I loved the shifting more and more. The shapes became their own, and I was surprised to find that I felt liberated by that. 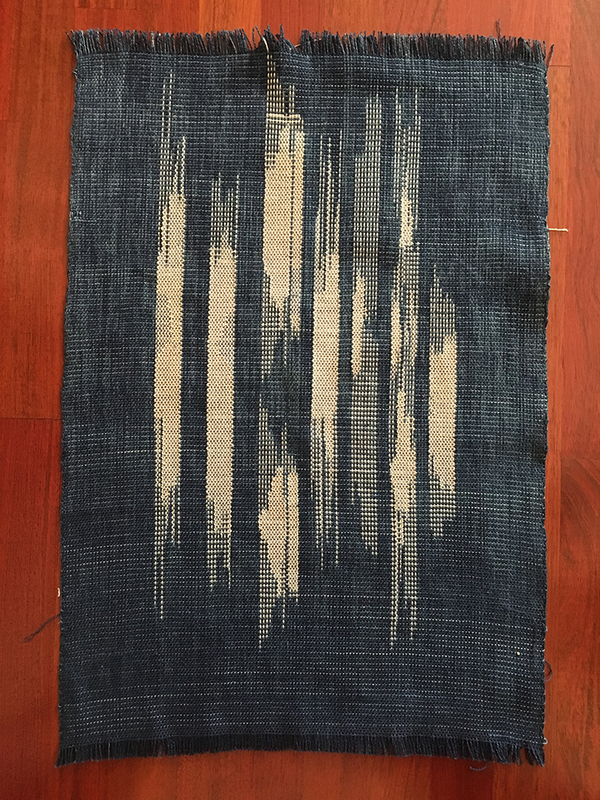 Each ikat attempt inspires me to do another and to research more about how this technique is done around the world. This month I'm making a quick visit to Toronto and am excited to see that the Textile Museum of Canada currently has an ikat exhibit on display. Hopefully I'll come back feeling inspired, with lots of ideas of new projects. This post was originally published on The Common Thread.